Zimbabwe wrapped up a 130-run victory over Bangladesh in Harare to complete a successful return to Test cricket after a break of nearly six years. The tourists began the final day on 112-3 chasing an unlikely 375 to win, but steadily lost wickets. Abdur Razzak made a defiant 43 but Bangladesh were bowled out in the third over after lunch. Zimbabwe now host Bangladesh in five one-day internationals and then play a Test against Pakistan next month. Home skipper Brendan Taylor was named as man of the match after scoring 71 in Zimbabwe's first innings total of 370 and an unbeaten 105 in the second innings, allowing them to declare on 291-5. Debutant seamers Brian Vitori and Kyle Jarvis also picked up five wickets apiece in the match. "We feel totally justified now at returning to Tests," said Taylor. "It has been a long, hard haul. We have worked so hard during the last 12 months, and the fact is we wanted to win more than Bangladesh did." The result ended a run of 11 Tests without a win for Zimbabwe, a sequence that included nine defeats. Player disputes, political rows and turmoil in the country had all left Zimbabwe with a severely weakened team as they lost to India by 10 wickets the last time they featured in a Test in September 2005. 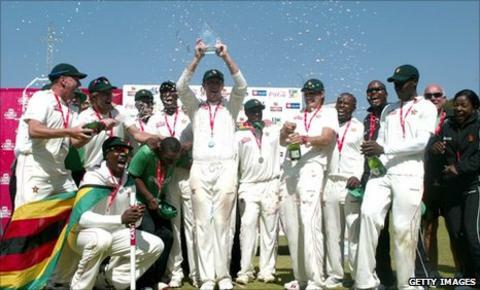 Zimbabwe then withdrew from Tests in January 2006, although they continued to play limited-overs internationals.